We all have digital cameras these days. The newer the camera, the higher the quality. The higher the quality, the larger the picture. Most of the time we don’t realize how darn big these pictures can be, often exceeding 6mb each. To upload your pictures using EZ Fit the file size may not exceed 4mb (or 4,000k). If your pictures are larger than 4mb the file size needs to be reduced before you upload. 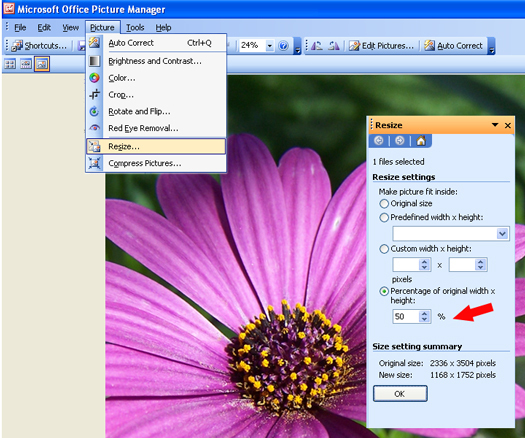 With any software you’ll want to seek out the feature called “image size” or “resize picture”. Depending on the program you can reduce (or scale) by a percentage, pixels or inches. For example, if your images is 5.8mb, reduce the file size by 50%. Adobe Photoshop and free edition Adobe Photo Deluxe have features that can reduce the image size. Plus you might find that the program bundled with your camera will do the job. This program is almost always installed along with your Microsoft applications such as Word or Excel and often goes unnoticed. Picture Manager is simple to use and works like a charm. On a PC you can launch this program by browsing to your picture, right-click on the file, scroll to Open With then select Microsoft Picture Manager. Not our first choice but online photo size reduction tools are out there. Make sure you are visiting a safe site before you upload or download. No matter what method you use to make your picture smaller, save the picture as a different name. If your original picture was named mypuppy.jpg, name it something like mypuppy_small.jpg after you have made the changes. This way you’ll keep the original high resolution picture in tact. The miniature picture added to your photo jewelry will not exceed .75″ wide at the most. Reducing the size of your original picture will not impact how it looks in your photo jewelry. You’ll be amazed at how good these tiny pictures look! We get it, this computer stuff is mind boggling sometimes. If you’re at your wit’s end, call (800) 746-7666, Monday through Friday, for help.